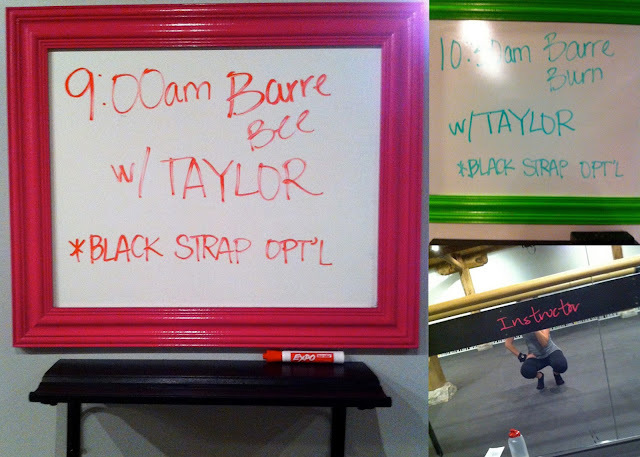 You have probably seen me mention on my Friday posts, going to 'Barre' to work out this weekend! Hope to take a few 'Barre' classes this weekend! etc, and or something along those lines. Well it's true I was. I mean I am!!! For the past year and a half, almost closer to two years by now, I have been attending multiple Barre Bee Fit classes a week in addition to the gym. To say I am in love would be an understatement.... I'm head over heels in love! I first went after purchasing an online deal for discounted classes, just looking to add something into the standard, run - lift weights routine. And to 'see' what a barre method style-class was all about! I get bored at the 'regular gym' easily and I needed something the would engage me. Engage my mind and leave me wanting more. After college when all team sports finally ended for me, I missed interaction with others in a 'positive, we are in this together' while we work out sense. That empty feeling I get after the gym, is so NOT Barre! It's a positive enviroment. It's encouragement to be your best you. It's pushing yourself, what are you capable of, what do you want to get out of your workout. All while creating a community of other strong, like minded women around you. And I love it!! The constant words of encouragement to push myself to my limit really struck a cord with me. It was a workout that I could determine what I wanted as an end result. My level of determination would lead me to my goals! And after years of competitive sports, that spoke to me. I have and always will be my own worst enemy, but on the days I want to give up - I have a positive teacher holding me accountable and pushing me to do more! And that's what spoke to me, and my admiration for Barre Bee fit grow! I can do more 'real' pushups now than I have ever been able to ever in the history of ever! I have definition in my abs. Oh yes I said it! And I have definition in my arms that no weight lifting obtained! But ladies and gents, it's here, COME LET ME KICK YOUR REAR!!!! If you are in Chicago, please come and try out the studio (Ladies only!) and come see me! I would love for you to try what I am so in love with! If you have any questions please let me know, I am more than happy to answer them for you! Its so great to find a workout you love! I alternate Zumba & Soul Cycle three times a week & I'm hooked! I have never been dedicated to working out till I started classes. I tried physique 57 too which is the hardest work out I have ever done but it was sorta awesome to be sore all over the next day! Good luck with your new teaching role, I bet your great at it! Yes, classes help so MUCH!!!! And thank you love! That's so awesome! I need to find some barre classes around here. I love barre classes, so I totally understand this deep love! Congratulations on such an amazing achievement! If I come to Chicago (I might in the fall for a half marathon! ), I'll totally try to come hit up one of your classes! Isn't barre the best?!!!! Oh that's be so fun!!! Ahh! First of all, I've been a reader, but not commenter for awhile now, and I had to comment on this post. I absolutely LOVE BBF, though I haven't been in awhile. CONGRATS on becoming an instructor! That's awesome! OMG - you go?! Come to a class, say hi!!!!!!!!!! That is so exciting that you are an instructor!! :) I have been wanting to try it out! Oh my gosh, I can't believe you became a teacher! That is AWESOME. I wish I was in Chicago to come try a class! I never tried it before, but I have a feeling I would love it. Go you!